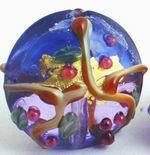 Sorry, we are currently sold out of 'Gleaming Venetian Murano Glass Button Beads'. Please check back later. Venetian-Color Murano Glass Foil Button Beads - Heavy! Sorry, we are currently sold out of 'Enchanting 3-Tone Amber Button Beads'. Please check back later. Sorry, we are currently sold out of 'Large Agate Dzi Button Beads'. Please check back later. Sorry, we are currently sold out of 'Beautiful Gaspeite Puff Button Beads'. Please check back later.